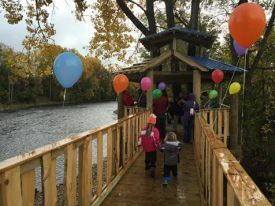 The tree house is named after local pediatrician Dr. Heidi Moore’s late son Max, who utilized a wheelchair and would have loved to be able to play in a tree house if he had the chance. 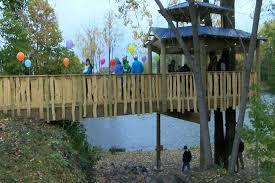 People of all ages and abilities will enjoy this unique facility along the scenic Saranac River. The Max Moore Memorial tree house adds value to our community by giving everyone a safe place to play, fish, or simply relax and enjoy the view. This project was initiated several years ago by Dr. Moore and the City of Plattsburgh. The city procured the first design sketches of the tree house from The tree house Guys, LLC, a Vermont-based company specializing in design and construction of unique tree house structures around the world. Two years into the planning process, Max Moore passed away. Project partners include: Sunrise Rotary, City of Plattsburgh & City Recreation Department, The Advocacy & Resource Center, Saranac River Trail Advisory Committee, and Vision2Action. In 2012, local Zumba instructors Autumn Love and Ashley Cousens had an idea for a Zumbathon fundraiser on Plattsburgh City beach. The two were inspired by the local Vision2Action movement and wanted to get involved in a local project that would increase recreation opportunities in the community. Picking up with the plans for the tree house project seemed a natural fit. From there, more partners joined Ashley & Autumn in efforts to raise funds. Over $32,000 has been raised toward the project! To donate to the project, checks can be made payable to "City of Plattsburgh", with "tree house Project" in the memo line and mailed to 6 Miller St, Plattsburgh, NY 12901. Donations will be tax deductible this way, as they are intended for a public project.